Last year I had said that The Soul Window (a.k.a. 'Window to my Soul (mate)') would be the last window lamp I would ever make ... but this has turned out to not be so. For those of you who don't know, for about a decade I have been making lamps out of the old windows of houses (I call them 'window lamps'). (You can read more about how I started making these lamps HERE). Hard to explain, but these are never just "lamps". I refer to them as 'three dimensional prayers'. Each window has a specific energy and purpose which, at some point in time, calls out to be manifested on the material plane. (Like us). That is how I've always felt it to be. The process of making each lamp is unique to that window and is an interactive healing process and experience on many levels (not just the physical) - for me, the recipient and those who follow the online documentation of the creative process. (In 2006 I started recording the process of the newer lamps online through words, photos, video and audio). While walking early one morning about two weeks ago, I got the strong feeling to make a new window lamp, but I dismissed it because I had said I wasn't making any more. Then a particular phone call that very morning confirmed that I must. (That is just to show how the Energy and Spirit part of the window lamp process works). Luckily I had an old window stored under the house. So I immediately went and took it out, took it to the bottom of the garden and placed it under the sapodilla tree, where I washed it. The washing of a window is an important part of the creative process (it is a cleansing on many levels) ... and each window is washed in its own special way - in the sea, in a river, under a tap, with a hose ... etc. depending on the feeling I get for that particular window. (e.g. 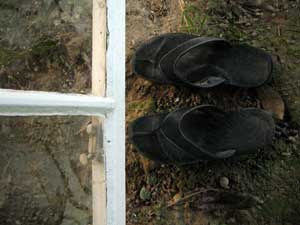 See here for photos/written account of the washing of one window, which became the lamp named "Serendipity"). 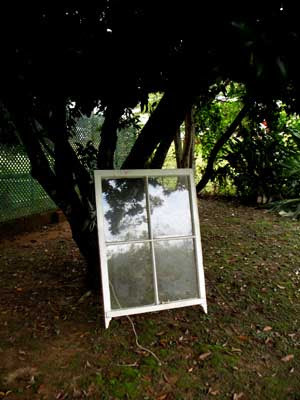 Anyway, about the old window under the sapodilla tree. I felt strongly that I was being guided to make it into a lamp soon ... but I had no idea who it would be for. Then, very early yesterday morning as I sat quietly under a tree after my walk, it struck me with amazing clarity who and what this window was all about. Soon I will reveal the name of the lamp and its important purpose. Please stay tuned. This is a very important lamp and your participation in this particular process will be invaluable and life-changing. (As with the other window lamps, I will record the creative process/evolution here on the blog). purpose as always, dynamic as usual...you!! keep me posted! exciting things! Elspeth, this is Vashti. I am intrigued. I tried to imagine the finished product and I could not. The creatively challenged will have to just follow the progress! Exciting! I am looking forward to this journey with you! Hey, and I got your post card today. Big smile. Thank you for including me such an exciting event. I feel honoured to be a part of the process. This window is my new Window of Opportunity... it opened for me today, as I have read this today. Hellom newly Londonised friend. I am glad the window opened for you. Spec.